I am keeping this week’s blog short and simple, but it is important. If your ball is lost anywhere outside of a water hazard, or is out of bounds, and you have not played a provisional ball….. This means that the player must play a ball, under penalty of one stroke, as nearly as possible at the spot from which the original ball was last played (Rule 20-5). Despite what some golfers may tell you, there is no other option. In particular, it is not permitted to drop a ball close to where the ball went out of bounds, or where it was thought to be lost for a penalty of two strokes. Anyone who does so, will incur the penalty of disqualification, from the competition in a strokes competition, or from the hole in Stableford, bogey or par competitions. Note also, that at anytime, anywhere on the course, a player may, under penalty of one stroke, play a ball as nearly as possible at the spot from which the original ball was last played, i.e. proceed under penalty of stroke and distance. The consequence of this is that if you do not fancy your next stroke (e.g. in deep undergrowth, under the lip of a bunker, or behind a large immovable obstruction on the line of play) and the other two options under Rule 28, Ball Unplayable, do not provide you with a favorable dropping location, then you may choose this option of taking the penalty of stroke and distance. Rules enthusiasts may want to check out the Golf.com podcast, in which Alan Bastable chats with USGA Senior Director of Rules of Golf & Amateur Status Thomas Pagel. At 40 minutes (including ads), it is a long listen, but it does contain interesting detail on Pagel’s job, how the Rules of Golf evolve, the decision making behind the four significant changes that are effective from 1st January 2016 and, for the final 5 minutes, Pagel’s thoughts on the simplification of the Rules. Here is the link to this Golf.com podcast. I have almost finished upgrading my eBook and other eDocuments with the changes required following the amendments to the Rules and Decisions, effective January 1st 2016. So, don't hold back on ordering a useful Christmas present for golfers of all ages and handicaps. All my eDocuments can be accessed at RhodesRulesSchool.com. What about a ball that is lost in an immovable obstruction or in ground under repair? Rules 24.3.b and 25.1.c allow to proceed in a different manner than playing a ball under 27.1, don't they? 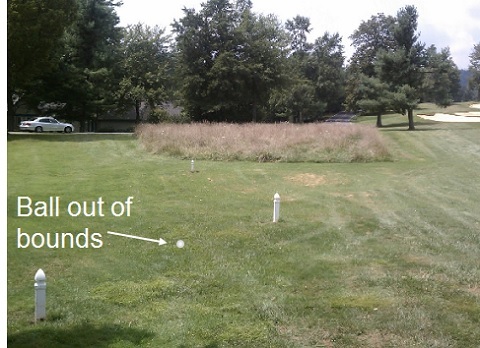 It is a fine point, but a ball cannot be 'lost' in an (im)movable obstruction or an abnormal ground condition. The player has to know or be virtually certain that their ball has come to rest on or inside the condition before they may take relief under Rule 24-3 or Rule 25-1c. Hence, the word 'lost' does not appear in either of these Rules, instead the phrase used is 'ball .... not found'.